The Browne Family, Earls of Kenmare. 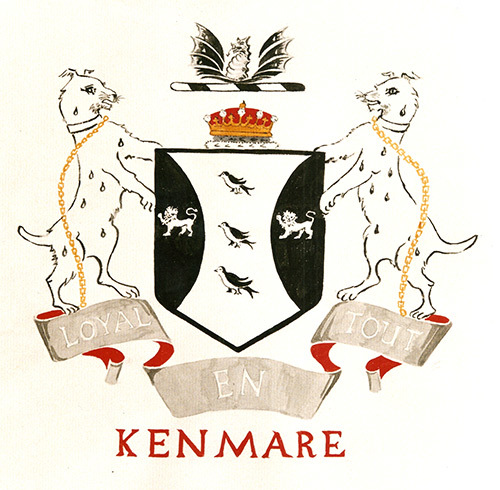 Coat of Arms, Browne family, Earls of Kenmare. During the eighteenth and nineteenth centuries, most people in Ireland lived as tenants on small farms or holdings that formed parts of large estates. These estates were usually the property of English or Anglo-Irish landlords, who were typically separated from their tenants by matters of religion, culture and often language. Landlords usually employed a land agent to manage and administer their estates and to collect their rents. The latter usually fell due twice a year, on what were known as 'gale' days in May and November. In the late 1870s, a deep economic recession resulted in the Land War, which erupted during the winter of 1878-1879. The Land War was a period of agitation orchestrated by the Land League, a mass movement that sought rent reductions and an improvement in tenants' rights. The British Government introduced a series of Land Acts between 1870 and 1909. These acts eventually led to the widespread transfer of landownership from landlords to occupiers. The Desmond Rebellion led by Gerald Fitzgerald the Earl of Desmond, against the English crown, came to an end in November 1583. The Province of Munster was devastated after four years of war and many people died of famine. The lands of the rebels were confiscated and granted to 'undertakers' loyal to the English crown. Sir Valentine Browne was granted the lands of O'Donoghue Mór of Ross, near Killarney. For almost 400 years the Browne family held these lands. House constructed at Killarney by Valentine 3rd Viscount Kenmare, c. 1725. In 1861 Queen Victoria spent the night of Monday 26 August here, before departing for the Herbert residence at nearby Muckross. The house was demolished during the 1870s. (1754-1812) created First Earl of Kenmare 1801. In the mid-1720s, one member of the Browne family, Valentine 3rd Viscount Kenmare (c. 1694/5-1735), built a new house at Killarney. His son, Thomas 4th Viscount Kenmare (1721-1795), was largely responsible for the development of the town. Aside from promoting tourism, he encouraged the building of roads and houses and he attempted to establish a linen industry. 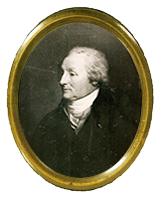 Thomas' son Valentine (1754-1812) was granted an earldom in 1801 for supporting the Union with Britain and he adopted the title Earl of Kenmare. The secondary title of 'Castlerosse' was reserved for the eldest Kenmare son during the tenure of each earl. The notorious land agent Samuel (Sam) Hussey replaced the more lenient Thomas Gallwey as land agent to the Kenmare Estate in June 1874. Hussy instigated quite modest rent increases between 1875 and 1878. At the same time however, the Fourth Earl of Kenmare Valentine Augustus (1825-1905) was engaged in building a new red-brick mansion over-looking Killarney's Lough Leane (the Lower Lake). The Land War, which erupted during the late 1870s, saw widespread violence and intimidation spread to the Kenmare Estate. This in turn led to rent arrears almost doubling between 1880 and 1882. The reduction in revenue from rents, coupled with the financial cost of the new mansion, caused the Browne family severe financial difficulties. 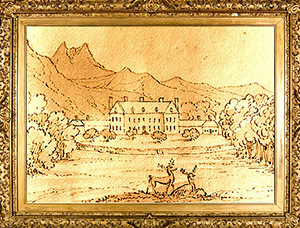 As a result, by the end of the nineteenth century, the Brownes had started to sell off their once great estate to their tenants. 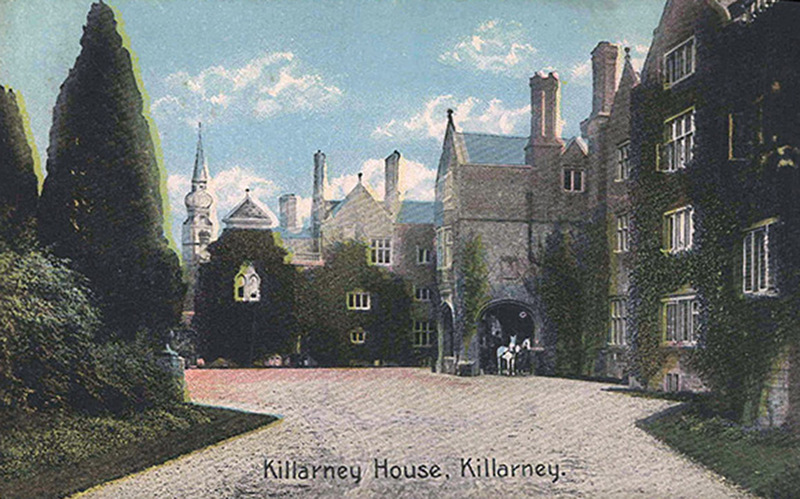 4th Earl of Kenmare, Killarney House was destroyed by fire early in September 1913.